"A terrible year is winding up with something that is very rewarding." 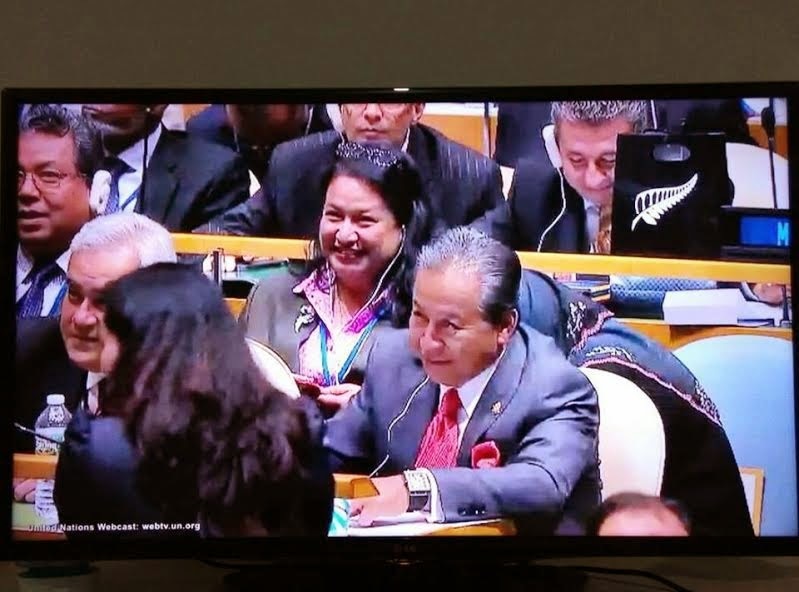 - a Wisma Putra officer jots down on her Facebook after Malaysia won a place in the United Nations Security Council. The blogger Big Dog has the story in Congratulations, Anifah. "I am grateful to be given the opportunity to lead a good team and to serve the country." Most people would immediately give themselves a pat on the back and angkat bakul sendiri. Anifah Aman deserved to be at least DPM.... he is the type less talk but more work. A PM material... UMNO is not lacking of candidates for great leader but money/corruption is holding back this people from moving up the rank. There is no better person for the job. Datuk Seri Anifah Aman is an example of what our government should be. A big step for all Malaysians. pergh senyuman tu x seperti nak serve rakyat jer, macam ada parti misteri malam ni Datok? Nampak gayanya, lagi kerap lah PM kita menghabiskan masanya di Luar Negara. Kena buka office kat New York la pulak. Hari tu rasmi office Khazanah kat California kemana? 1MDB boleh tumpang? Najib seolah-olah sangat bangga bila di dampingi Omputih. Siap berselfie lagi. Sikap Najib jelas amat bertentangan dengan Tun Dr.M. Jangan sampai 'telur' kita dalam genggamam mereka, sudah. "Most people would immediately give themselves a pat on the back and angkat bakul sendiri. " are your standards that low for him? that is a normal response of a man in that position. anything less would be atrocious. the fact that a normal response gets a compliment is sad. either that or you are trying to angkat his bola. Malaysia is in because US says so ...Why? your famous PM sayings...scratching your back and my back..
Later on the screws will be applied for everything...trade pacts..defence ..cooperation on terrorists etc...What was the last pact Obama wanted M'sa to agree....umno was sooo unhappy even old boy Mahathir... lets see if US gets through this! Always remember they will be no UNITED NATION if US is not in...See the favoured nuclear few countries are the honoured ones and they have one thing "Veto " power...Malaysia will have to play ball and blash..blah.. where nobody listens..So whats so great about it? Yes I think that is what he should be. The sparring partner for Najib. Maybe jumping the gun too early. He should be at least be a VP for UMNO. Existing VPs does not leave much confidence. Zahid too much grandstanding but no contribution to party. Believe he has not severed his Anwar link. Shafie petty corrupt and destabilising Sabah. He has been buying votes and buying Ketua Bahagian to kock out Musa aman. There is no such thing as sabah quota but if there is, replace him with Anifah. Hishamuddin too afraid to make decision and populist that he is a risk. KJ ... not shown ability to deliver anything. Mukhriz ... not in control of his political path. Procrastinating leadership. Under the UN Charter, the Security Council has primary responsibility for the maintenance of international peace and security. Each of the Council's members has one vote. Under the Charter, all UN Member States are obligated to comply with Council decisions. The Security Council takes the lead in determining the existence of a threat to the peace or acta of aggression. It calls upon the parties to a dispute to settle it by peaceful means and recommends methods of adjustment or terms of settlement. In some cases, the Security Council can resort to imposing sanctions or even authorize the use of force to maintain or restore international peace and security. The Security Council also recommends to the General Assembly the appointment of the Secretary-General and the admission of new Members to the United Nations. And, together with the General Assembly, it elects the judges of the International Court of Justice. Prior to this, Malaysia has been on the UNSC thrice - in 1965, 1989 till 1990 and 1999 till 2000. There were 5 countries that did not vote Malaysia, one of them abstained from voting. Do you know the 5 countries, Datok? Easy guess is the Israeli. 4 other countries? If that's his only motivation , fine and good. How do the other candidates for leadership fare as regard their motivation? How are they going to help delineate or resolve the Malay and Chinese dilemmas, along which the main battles are being fought? Agree we should focus on performance criteria and motivation but shouldn't exclude people on grounds of background. Saya harap DS Anifa Aman boleh buat keputusan sendir dan tidak jadi penyambung lidah AS yang nsecara tak langsung penyamdung lidah YAHUDI la'nat. Americans and Australians but they realise that but at least they don't call themselves sons of the soil like you do. Yes, we are now in the company of Venezuela! I think it's time for us to appoint a second DPM from Sabah based on their economic and man power contribution in ensuring the success of 1Malaysia. Foreign Minister Anifah Aman is the right candidate for the job!